All proceeds benefit Parenting by one ministry! Dentist anyone? The first image: Thomas and Penny wanted a 'different' photo for the records. Not to be out done, this next group decided that they needed a back massage [hopefully the spikes did not go in too deep]. 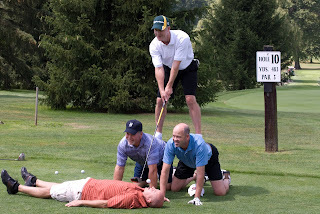 While they were getting the back massage they figured they would go after the team record for the longest drive. 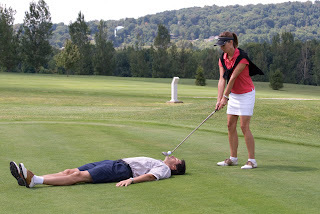 Yes, the course doctor had a few extra teeth in his black bag. I will have more images from this an a few other events posted later in the week.